Have you ever erased something by accident on WhatsApp? Who hasn’t, right? You may have thought that whatever it is you erased was never coming back. But, if not too much time has passed since you deleted that image (for example), there is still hope. The following methods should help you to get that conversation you erased back finally. Make sure that you read carefully and double check that you entered everything correctly or else it will not work. To be able to recover WhatsApp content you’ve deleted, you should already have the backup option enabled. 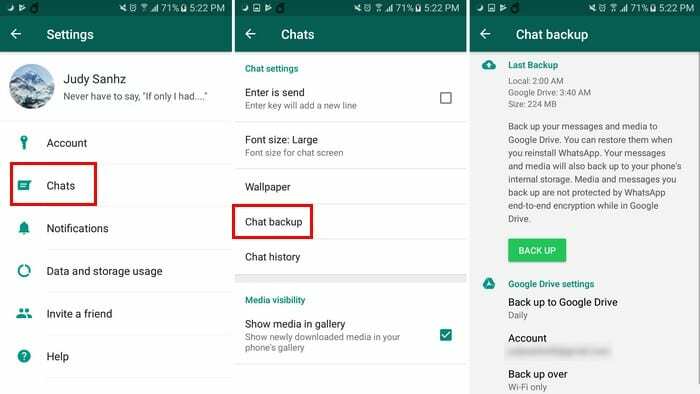 To enable the backup option go to WhatsApp’s Settings > Chats > Chat Backup. In Chat Backup, you can set up where you want your WhatsApp backups to go to. You can also set up how often you want those backups to take place. For example, you can set up the backups for Only when I tap “Back up,” daily, weekly, or monthly. At the bottom, you can also check the box that will even backup videos. Right above that option, you can decide if you want to back up over only WiFi or Cellular. You can only recover the deleted messages if you erased them after you set up the backup process. 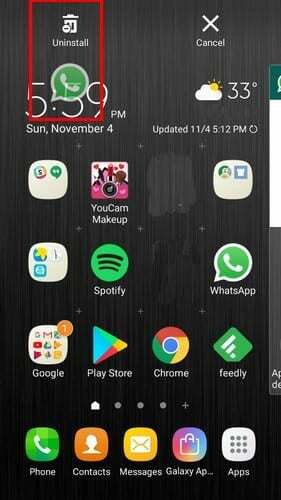 Just uninstall the app by going to the app drawer and dragging the app icon to the uninstall option. 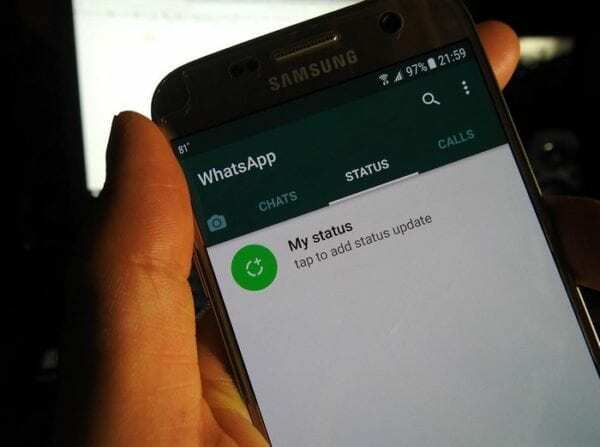 When you install the app again, WhatsApp will ask you to restore the backup, and that includes all the messages you deleted after you set up the backup feature. If you deleted the message after the backup process began, there is still a way you can recover it. 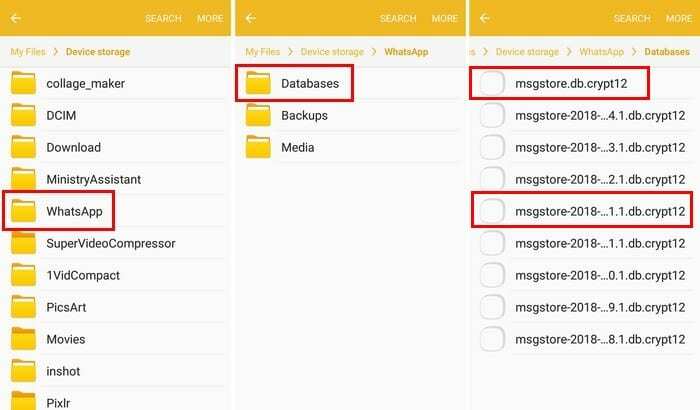 Open your Android device’s File Explorer and go to WhatsApp > Databases. In Database, look for the file that’s named msgstore.db.crytp12. This is the file where the most recent messages are saved. If you’re looking for messages for a specific date, look for the file that’s named msgstore-YYYY-MM-DD.1.db.crpt12. The Y’s, M’s, and D will be replaced with a date. To get your messages back, you will need to rename the files. For example, the file named msgstore.db.crytp12 will need to be changed to msgstore-latest.db.crytp12. The file named msgstore-YYYY-MM-DD.1.db.crypt12 needs to be changed to msgstore.db.crytp12. To change the name of the file, long-press on the file and tap on More at the top tight. Then, select the rename option. Once you’ve done that you’ll need to uninstall the app. You’ll also need to erase your Google Drive WhatsApp Backup. To do this go to Backups in the app’s slide-out menu, and look for the WhatsApp file. Tap on the three vertical dots and choose the delete backup option. This is where you re-install WhatsApp, and once again, it will ask you to restore your messages. Choose the file you just modified that is x days old and not the most recent one. Once you’re done, you’ll need to change the name’s of the files to their original name. For example, the file that is currently named msgstore.db.crytp12 needs to be replaced back to msgstore-YYYY-MM-DD-.1db.crypt12. The file that is now msgstore-latest-db-crytp12 should be changed to msgstore.db.crytp12. We’re all erased WhatsApp content we later wanted back. With the previously mentioned tips, you’ll finally be able to get them back. How much did you regret deleting your last message? Share your experience in the comments. I got to restore my cheating partners phones and other devices, live location, messages and so on.